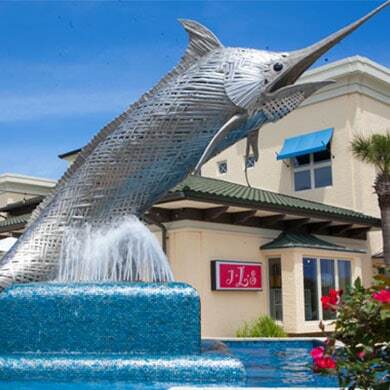 Just a few minutes east of our hotel on the beach Orange Beach Alabama, you’ll find a lovely shopping and dining center that backs up to a marina. You’ll know you’ve found it when you happen upon the giant metal jumping marlin fountain at its entrance. This is a lovely place to end a beach day, with a variety of things to see and do. From upscale boutiques to restaurants and a spa, dolphin cruises or ‘paint-your-own’ souvenirs, spend a morning or afternoon exploring away from the shore. In the middle of SanRoc Cay is a bar with tons of cozy lounge chairs and picnic tables covered by pretty, white umbrellas. This is a delightful spot to grab a cocktail and chill out for a while. Beyond the shopping center, you’ll discover the marina, brimming with boats to fuel your daydreams. Walk around and imagine yourself aboard a fancy yacht, or book yourself passage on a charter fishing vessel or dolphin cruise. You can also rent paddleboards, kayaks or jet skis here. But what can Dad and the kids do while Mama shops? SanRoc Cay thought of everything … there’s a small playground adjacent to the bar. SanRoc Cay is located at 27267 Perdido Beach Boulevard in Orange Beach AL. For more information, visit the SanRoc Cay website or call (251) 981-5423.